“Before he wrote it, he lived it”? The James Bond brand has awesome power. When Agent 007 helped Queen Elizabeth II to parachute into the opening of the 2012 London Olympics, the world gasped (and then laughed) at the witty conjunction of two instantly recognizable icons of Britishness. There was an extra significance: the first fiction featuring James Bond, Casino Royale, came out in EIIR’s coronation year, 1953, and so through the dozen novels and two dozen lucrative films, the very patriotic (and ever youthful) Double Oh Seven has always been On Her Majesty’s Secret Service. Tired cultural brands need refreshing, the marketing men in silly glasses say. We punters recognize the same-old, same-old names but want updates and new twists. Take the consulting detective Sherlock Holmes and his bromantic pal Dr. John Watson, for example, rebooted on the big screen, reinvented in television on both sides of the Atlantic, huge in China, and burgeoning in new versions at all points of the compass. You can play around with Holmes and Watson as you wish because Sir Arthur Conan Doyle died in 1930 and it’s free-for-all on his characters now. But you can’t mess with James Bond unless you own the franchise like Eon Productions and the Fleming family, because Ian Fleming died only fifty years ago in August 1964, and there are still two decades to run on his copyrights, which are litigiously protected. Meanwhile, the Bond film marque successfully refreshed itself in the 23rd Bond film Skyfall, with a new M, a new Q, a new Moneypenny, all ready for Bond 24 and 25, because, like the monarchy, the firm and the show must go on. So how can someone else get a slice of the eager worldwide market for Bondian guns, girls and gadgets, free of copyright and licenses? Well, one idea is to focus on Ian Fleming himself, the man who wrote the James Bond books in the 1950s and early 60s, sourcing their excitements in what he did in the Second World War. The slogan for the new four-part series Fleming is: ‘Before he wrote it, he lived it.’ In other words, that Fleming was a kind of James Bond, in WW2. In his job, Fleming liaised with most of Britain’s nine secret organizations of the Second World War, including the Secret Intelligence Service (MI6), the Security Service (MI5), the sabotage and subversion people of the Special Operations Executive, as well as the hush-hush Government Code and Cypher School at Bletchley Park. Fleming was ‘indoctrinated’ into the ULTRA secret of the interception and decrypting of enemy wireless signals very early in the war. He set up an ‘intelligence assault unit’ of naval officers and Royal Marines to ‘pinch’ code-books and new technology from the enemy, who saw their first action from an offshore destroyer during the ill-fated Dieppe Raid of 19 August 1942. All this is terrific background for a future writer of spy-thrillers, but it has to be said that, apart from that day-trip to Dieppe, Fleming was not an agent or operative who ever went into the field himself. The yarn that he came top of a secret agents’ course at Camp X at Oshawa in Canada was invented by Sir William Stephenson in his anecdotage. Ian Fleming had bags of ideas, but he did not see action. He drove a desk, not a tank. He fired paper memos, not bullets. It’s a problem for a four-part TV series like Fleming. The truth of his life as a wartime bureaucrat is actually quite boring, as most writers’ lives are boring. Their job is to pound out words on a keyboard, not to have adventures. Of course there are writers who do cut an active dash: Byron, Hemingway, Malraux, etc. (One thinks also of Beckett and Camus in the French Resistance.) But most writers are much closer to Walter Mitty than to men-at-arms, living more by the willed hallucinations of imagination than by their memories of machismo. 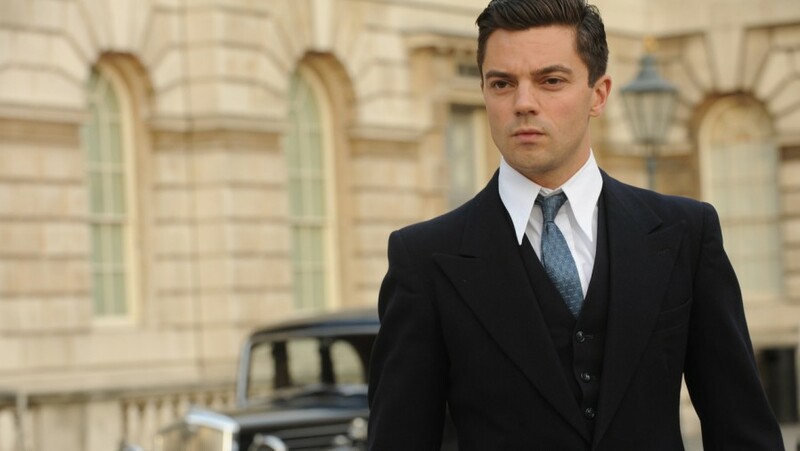 Dominic Cooper as Ian Fleming in Fleming. (c) BBC Worldwide Americas. So Ian Fleming was never a James Bond. The books are his unbridled fantasies of what might have been. But television is a literal-minded medium, so Fleming reverse-engineers the process. Nicholas Rankin is the author of Ian Fleming’s Commandos: The Story of the Legendary 30 Assault Unit which is publishing in paperback in March. Image credit: Grave and memorial to Ian Fleming at Sevenhampton, Wiltshire. Photo by Mervyn. Public domain via Wikimedia Commons.